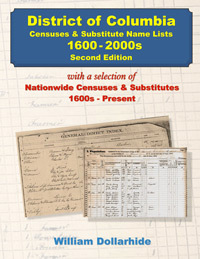 This new Second Edition includes 113 District of Columbia URLs - of which 14 are catalog and reference links. Forty-seven are links to databases; forty-three are links to FamilySearch digital captures. Three hundred thirty-five National URLs are also included. There are an additional 14 pages in the Second Edition (as compared to the First Edition).